Pink is the color of the day. I started working on this a while back but just got it finished. 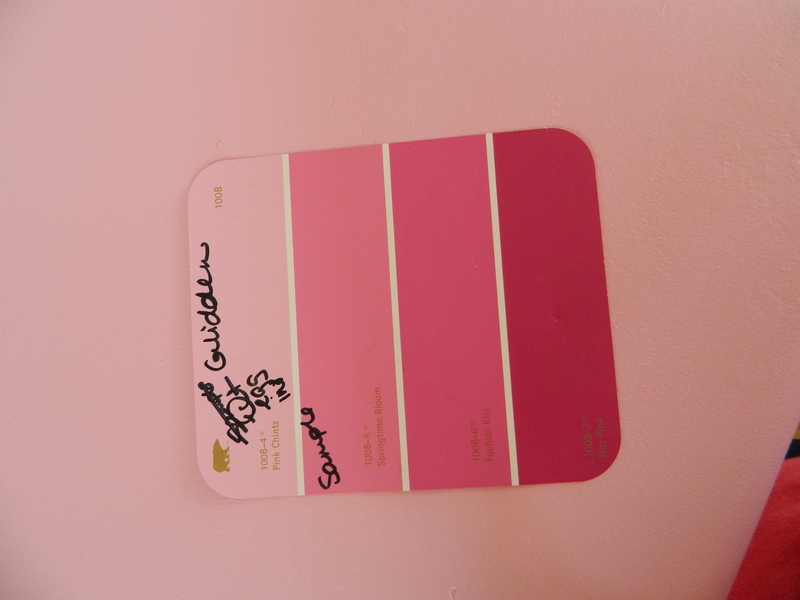 It all started with this paint sample card. And a dresser found at an estate sale. For a cool ten dollars, I snagged this well made, all wood dresser on the third day of the sale. It needed some TLC and some wood glue, but with the dove tailing on the drawers and the quaint bottom trim, I knew it was a quality piece of furniture. So after a short ride home, I removed the hardware, filled the extra holes with wood filler and wiped the dresser to remove the cobwebs (literally). It had been varnished and painted several times (why didn’t I take more photos? 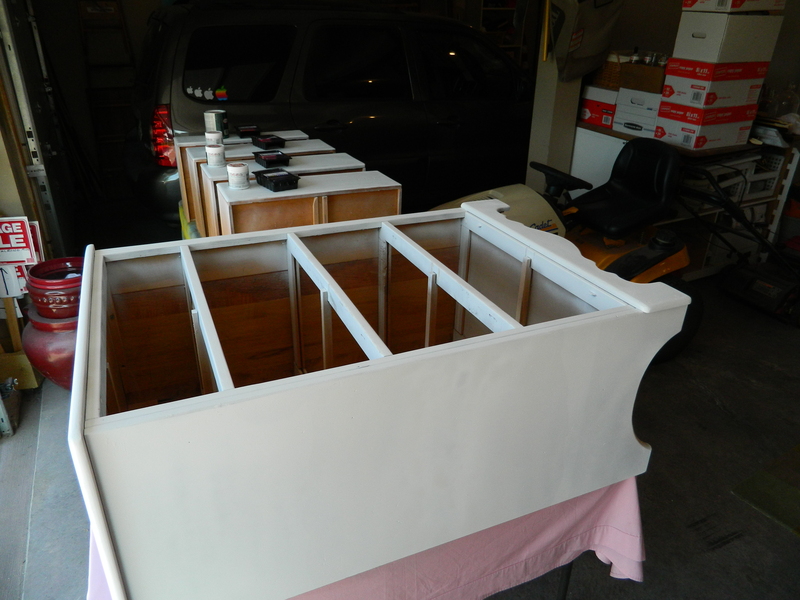 )… so it took quite a few sandings to get it down to a nice smooth finish to put down a smooth primer coat. 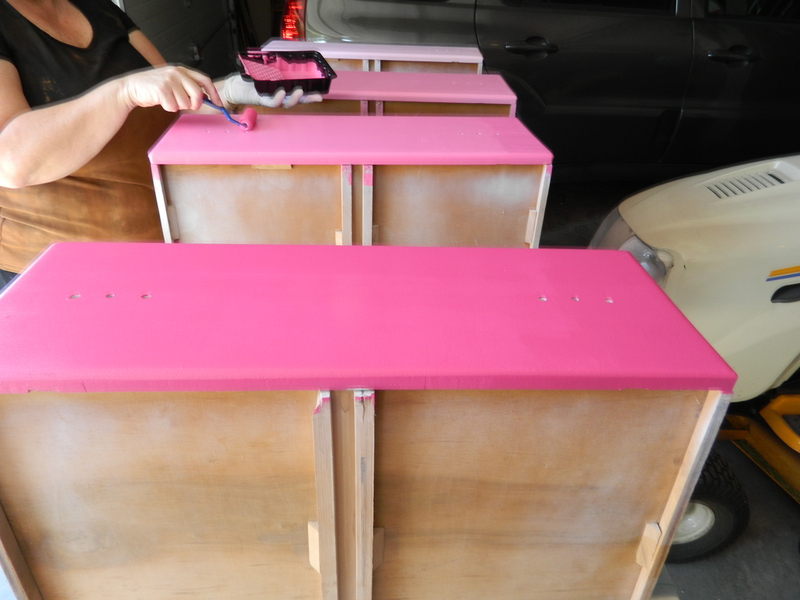 I have seen numerous versions of the ombre dresser, but when I saw this pink paint chip card (have you seen my paint chip card art? )… I knew this was what had to go on the dresser. 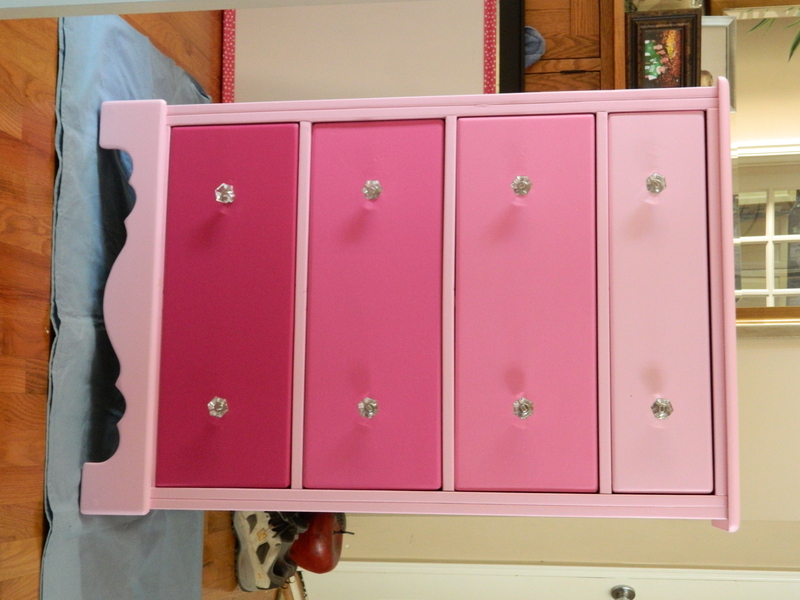 Because the dresser was destined to be for a little girl’s room, I wanted a finish that was resistant to finger prints and was washable. I used rollers to apply the paint and it resulted in a beautiful soft finish. Once it was dry, I added the glass knobs to give it a dressed up touch. At this point, I was on a roll with pink. 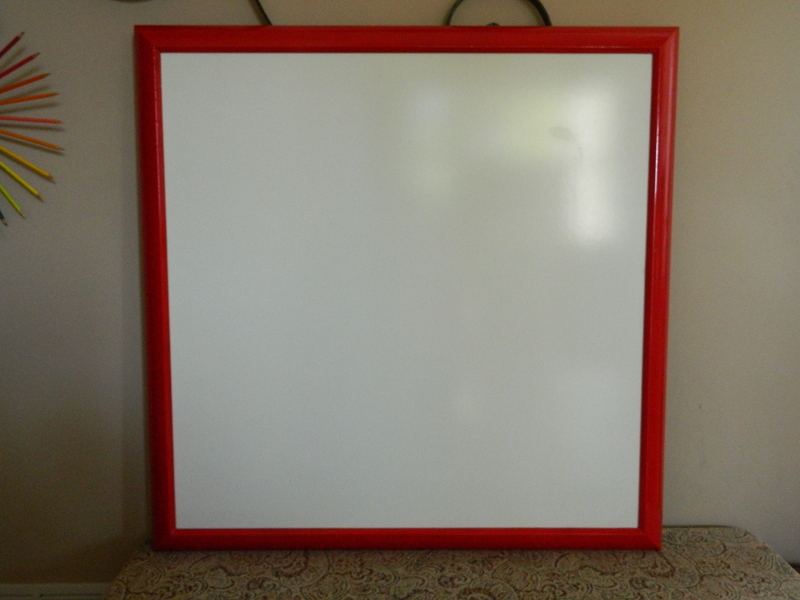 Next came a small white board, this was left over from last week’s projects. And of course that had to include polka dots. And this is light enough that any little girl could carry this around and use it as a drawing board. 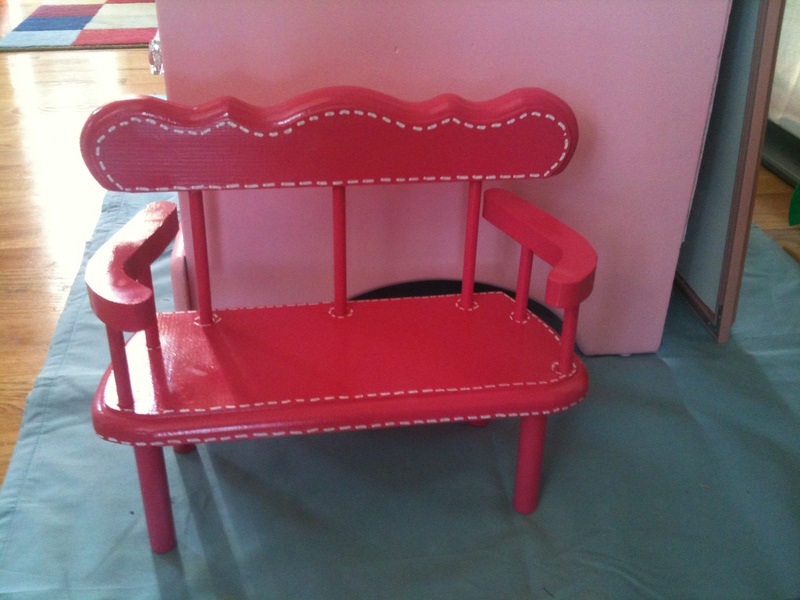 Next up, was a little bench seat that I also bought at the same estate sale for $2.00. I outlined it with small white “stitches”. Then I found this little miniature version of a dresser (could only find a three drawer) but painted it in the same colors as the full sized dresser. 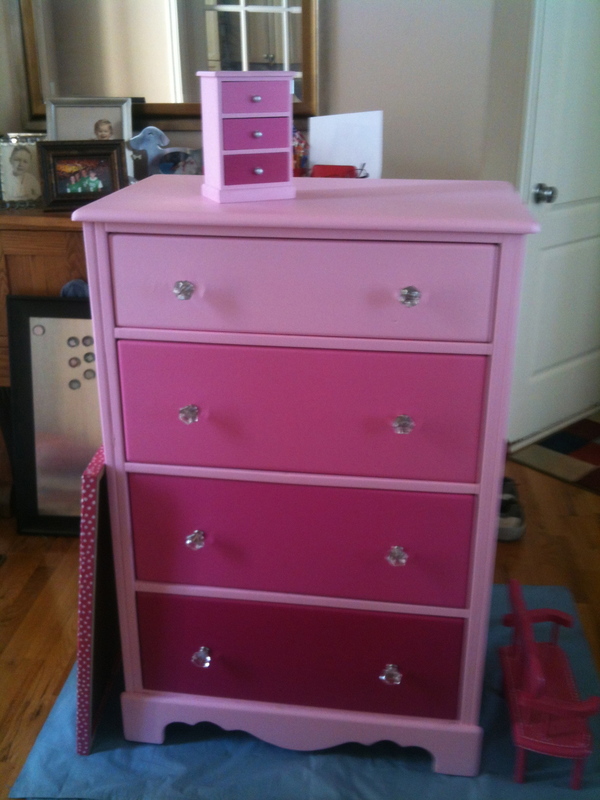 It would be awesome for the little girl who gets the dresser to use for her doll. Or maybe sitting on the dresser for hair bows and clips. I could even envision turning it into a small lamp. How cute would that be? Well, there’s the update for the week. I feel pretty accomplished considering that I also worked almost 60 hours this week at my real job. Come back again real soon! It has been a very productive weekend. More importantly, it has been a very fun weekend. I love when I get stuff done and have fun doing it. I am an avid freecycle.org user and have gotten some wonderful things on the site. More recently, I have started using Craig’s List (yes, I know, I am way behind on the times) and have started using it for both buying and selling. I don’t know how it went by unnoticed for so long, but I recently discovered the “free” section. I also go semi-regularly to estate sales and occasionally to yard/garage/flea sales. You just never know what you may find. 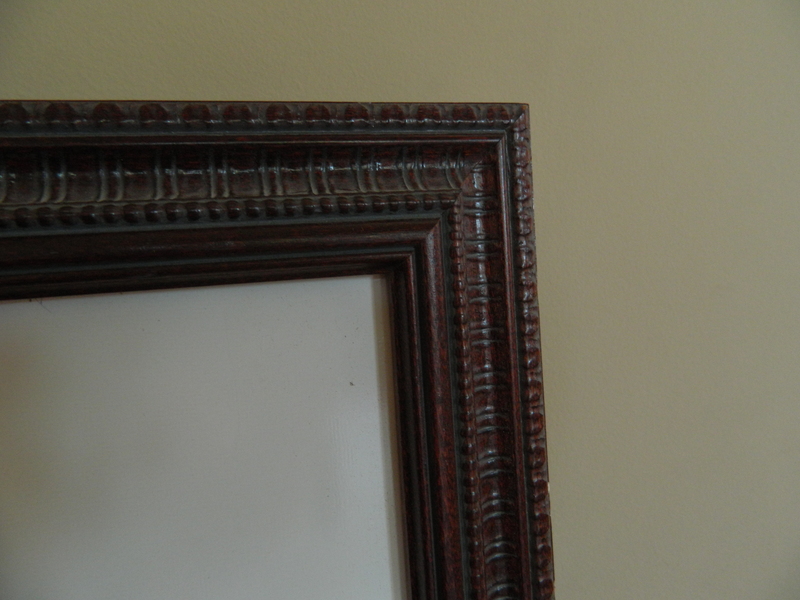 So, recently on Craig’s List’s free site, time was just right and I “rescued” a bunch of picture frame molding and a few actual constructed frames. Beautiful stuff for sure. I met the man who had set it out, he owns a frame shop and was just getting overwhelmed with the amount of “scrap” that he had collected and just decided to do a mass ‘shop’ cleaning. What a find! So, got it all home and started going through it. He was right, beautiful ornate frame molding. Started building some frames in addition to the completed ones. But what to do with it all once it was constructed? 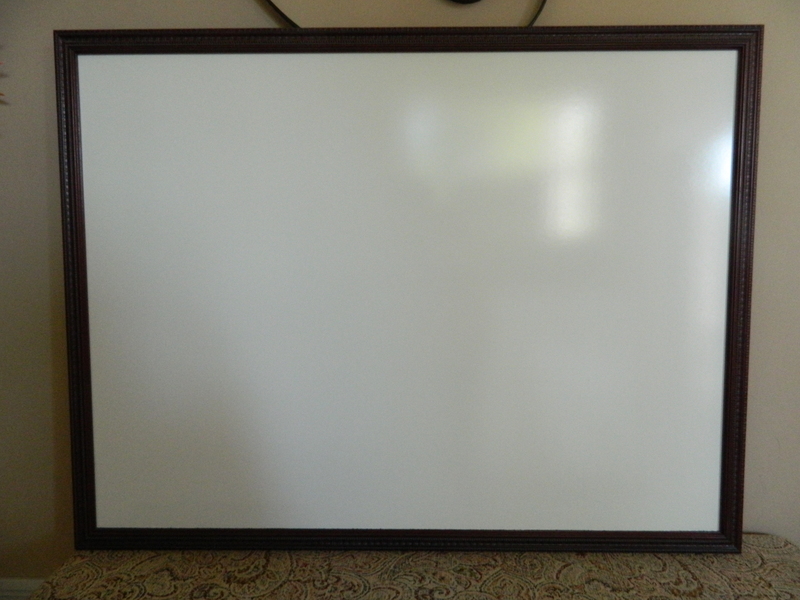 White boards. Yes, you heard me, white boards. They have taken over the world – both in schools and business. And they are ingenious. But I’ve always noticed that they have the same bland, boring silver full frames. Just because it’s business, doesn’t mean it has to be boring, right? When the Kid was young, I converted a space under the stairs into a play place (later becoming a handing storage place for toys). But with a coat of paint and a comfy carpet and some wonderful shelving, this became a great place for him to play and create. 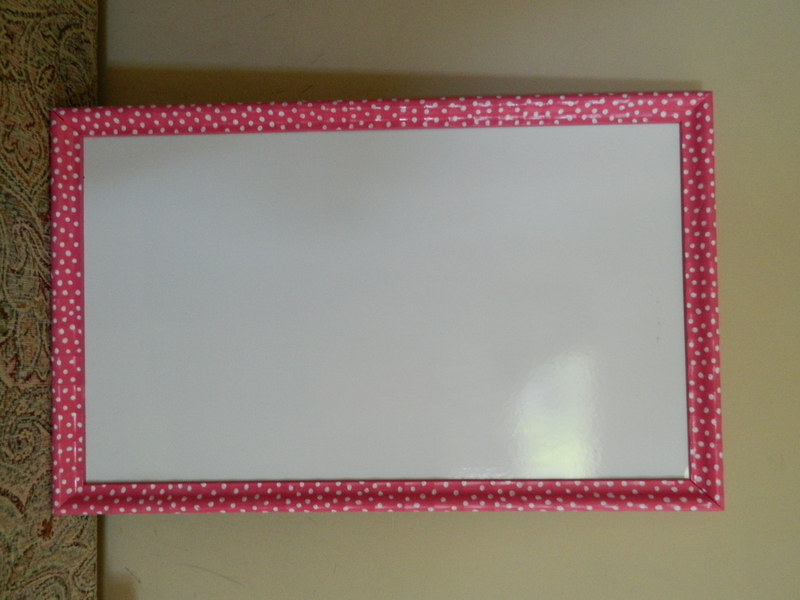 On one of the walls I mounted a white board complete with a little pail to hold the markers and erasers. He loves them still. I like them as well to be able to trade messages between me and the Kid and with a nice frame and a handy spot just outside the kitchen, it is convenient as heck. 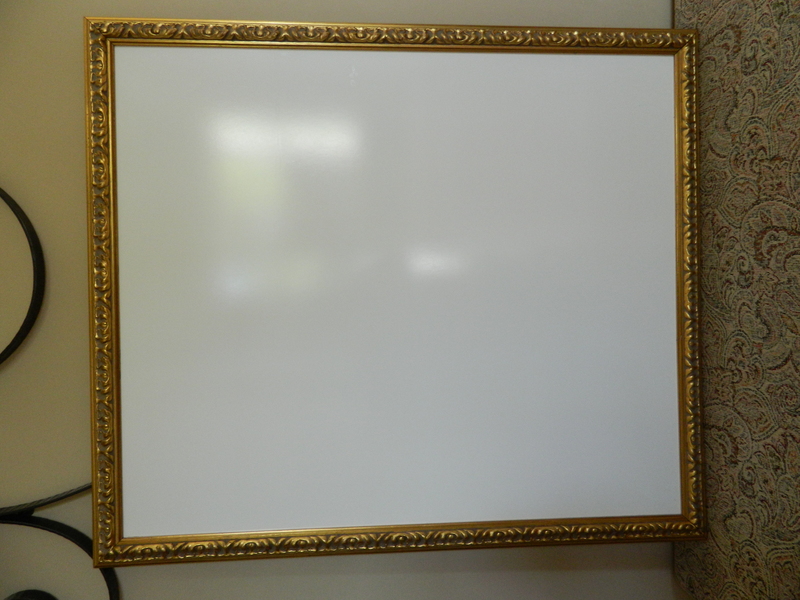 So, like I said, the frames started becoming white boards. And here are some of the completed ones. 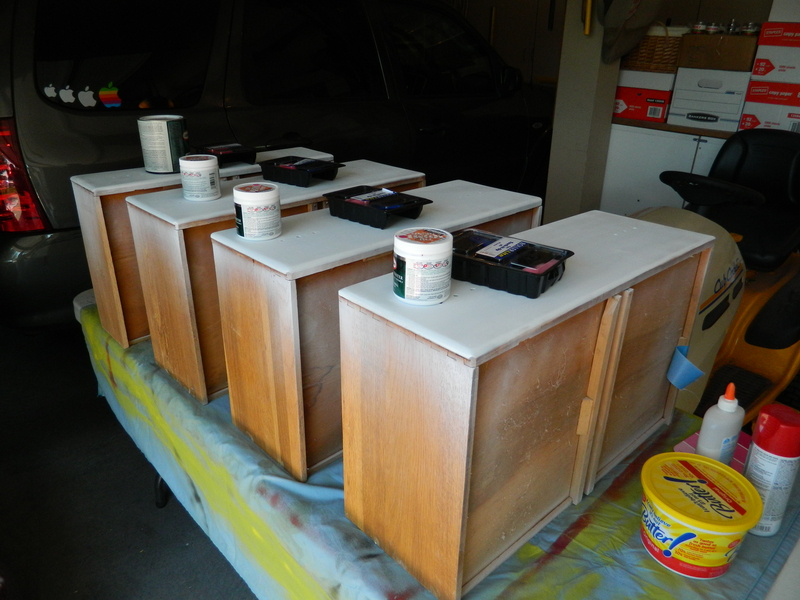 They are kind of odd sizes, I did my best to make full use of the moldings, making them as large as I could. 1. The first one is 37 inch square. It originally started out high gloss black, but that’s boring, so it became a gorgeous bold red. 2. Next, is the first utilizing an already constructed frame, a gorgeous detailed wood frame, 32 1/2 x 43 1/2 inch that could be mounted either vertically or horizontally. This is nice because it already has mounting hardware. I’ve included a close up photo of the wood, so you can see the details. Wouldn’t that look beautiful in any office? 3. 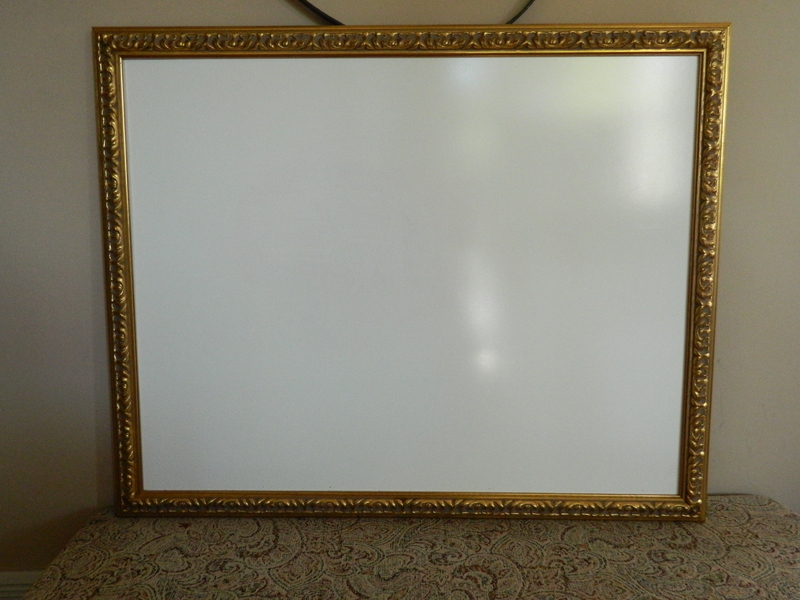 Next is a pair of gold framed white boards. Again, beautiful moldings. And they are great sizes, large enough to hold some serious work but not too large to be overbearing. And definitely not too ostentatious. A perfect blend of art and function. Left one is 34 x 40 inches and the right is 38 1/2 x 30. 4. The last one has a yellow frame, so cheerful. It is 38 1/2 x 31 1/2 and has an orange marker shelf (haven’t attached it yet) that is seen lying on the bench in front of it. I will have to find a place in my office for this. Last week, my team (and three new team members who are starting tomorrow) were relocated to a new area so that we all sit together. 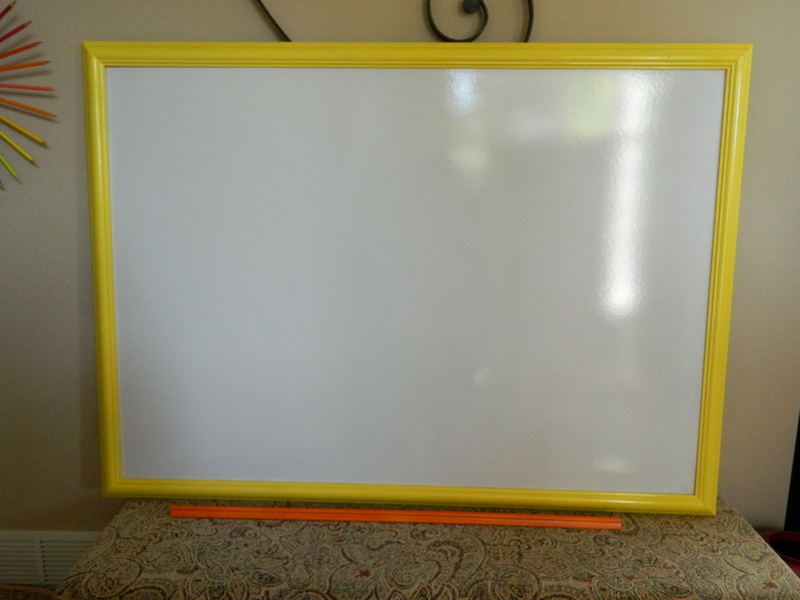 I think this makes the perfect white board to share ideas and info. I am excited to hear their comments. Also worked on a couple of other projects, but the primary piece still needs hardware, so I will save it for another post. Hopefully tomorrow. I am so excited about everything I got done this weekend and really spent so little to upcycle and recycle pieces; basically paint and hardware to get things done. I hope you had a productive and great weekend as well. Been a while since I’ve posted. Have some things to catch up on. Unfortunately, I am finding that taking pictures and documenting my steps are thing that I don’t do all that well. I get about two thirds complete with a project and it dawns on me that I’ve failed to take any pictures! Then I scramble around taking photos and hoping I got enough of it to make sense. Today’s post is about recycling candles. As I have mentioned before, I am a big fan of estate sales. I drag The Kid around with me (who occasionally finds a find or two) and I happened to stumble across a couple of used crock pots. Immediately I thought of a huge collection of melted candle ends. I never seem to throw anything away, especially all those candles that cost an arm and a leg. So, into the crock pot all of it goes. I heated it slowly as to not cause any smoke or burning smell. Then I got to preparing the molds. I simply used the 5 oz. dixie cups. 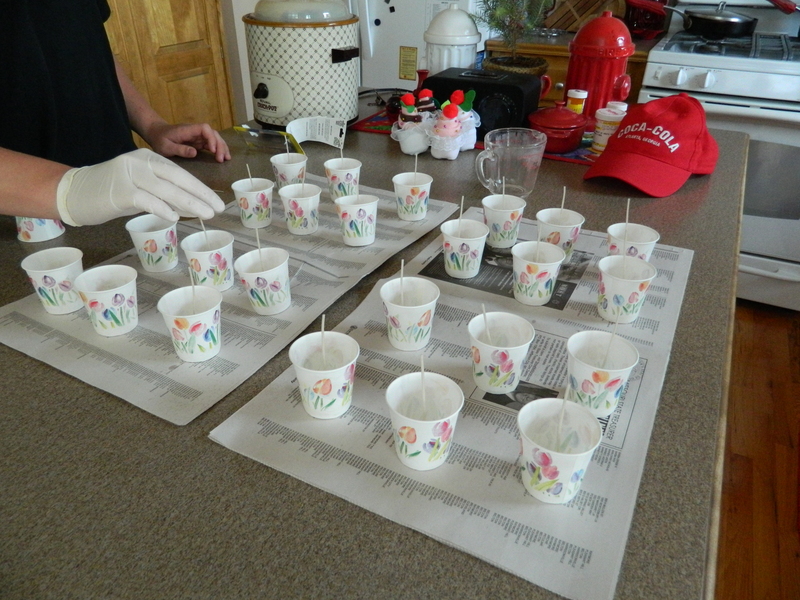 I sprayed a little Pam into each cup, spreading it onto the bottom and sides. Then I lined them up on newspaper and set into each cup a prepared wick (purchased at Michael’s in packages of 12) by dipping it into the wax and then placing it into the center of each cup. Once the wax was melted, I used a french fry strainer to scoop all the burnt ends, candle wicks and labels from the bottom of the crock pot. Using a glass measuring cup, I then carefully filled each cup. Once the wax started cooling, it was necessary to refill most of them to get a smooth, flat top. 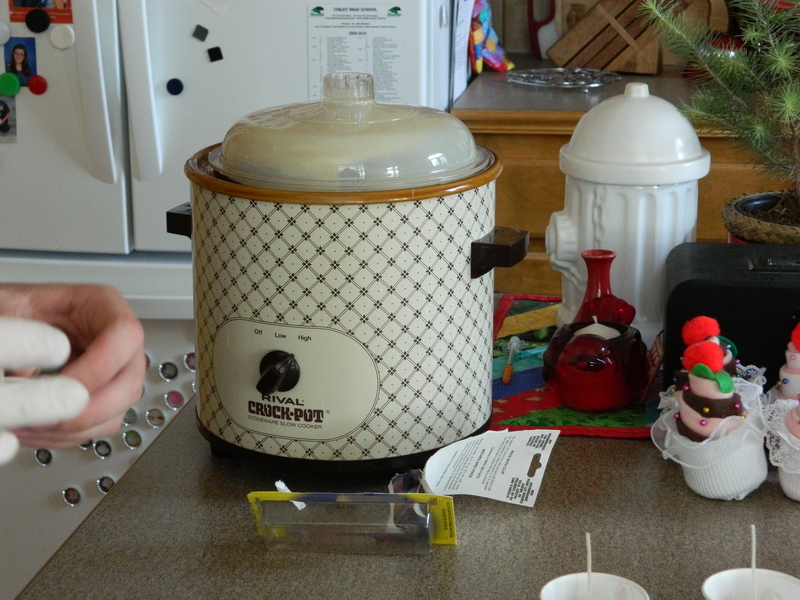 Then it was just a matter of allowing the candles to cool completely. Once the candle was cooled, it just slipped right out of the cup. Viola! Replacement candles all ready to go. Easy and quick. I’ve already started collecting the next round for reuse. A couple of other quick items. 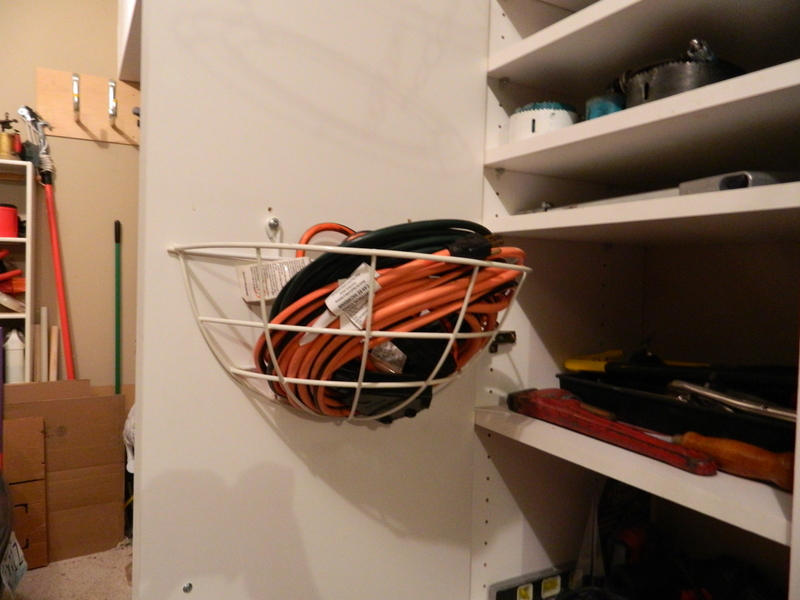 I saw that someone had done something similar and wanted to show that I had used this trick to store extension cords in the garage. Keeps things neat and tidy. Also, happily, some of my love of creating and baking has rubbed off on The Kid. 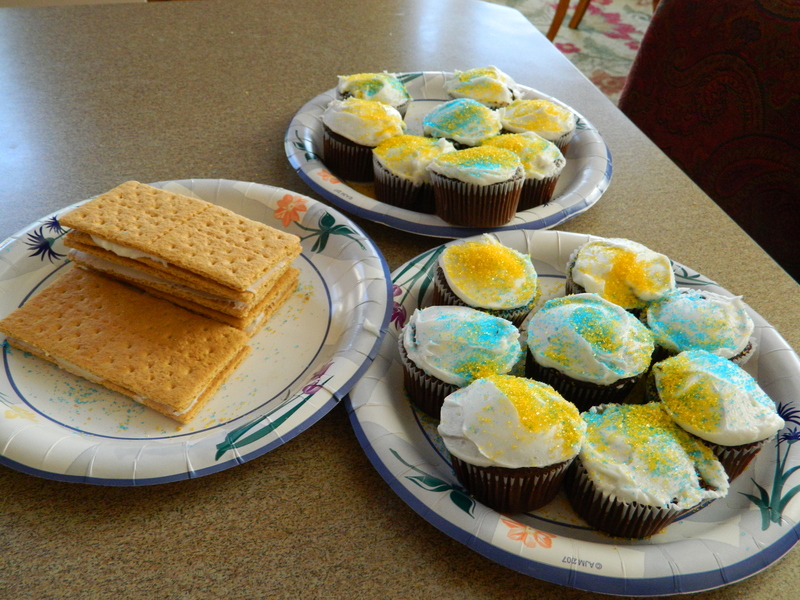 I came home from work last week to find that he had baked cupcakes! And with the leftover frosting, he had made an old family favorite, ‘graham cracker cookies’. I am so proud! So, that catches us up a little, I still have so much. I hope to do much better in keeping up on the blog. Thanks for dropping by and I hope you’re all having fun. P.S. 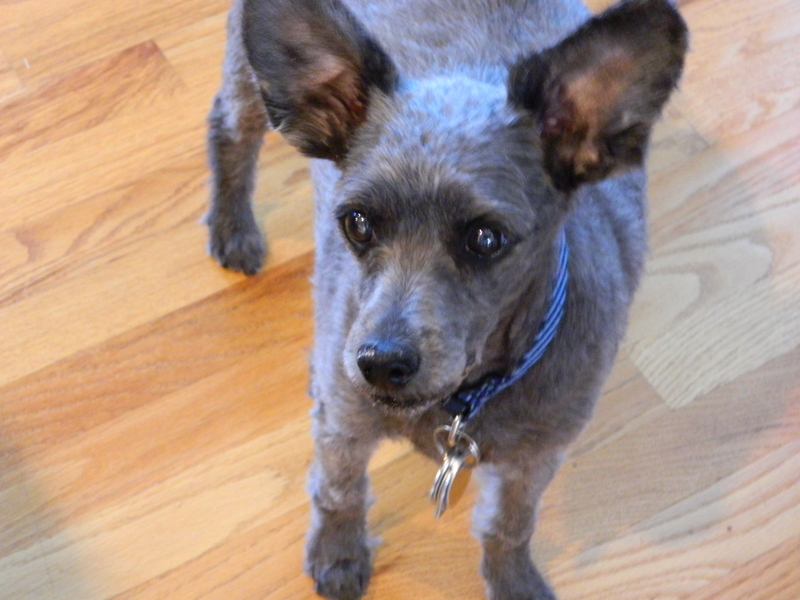 Here is my helpful assistant… Ashla.